A. aureus Willd. in Act. Acad. Berol. 29, t. 1 (1794); Syn: A. pseudotraga-cantha Pall., Astrag. 3, t. 3 (1800). Map 27, p. 127. Dwarf cushion-forming shrub, up to 25 cm. Leaf rachis spiny, 1-6 cm, straight, white-hairy or glabrescent, breaking off completely with age leaving bare woody stems. Leaflets 5-10 mm, linear-elliptic, often folded, mucronate, both surfaces glabrescent or sparsely white, spreading simple-hairy, usually glabrescent when mature, 4-6-paired. Stipules c. 10 mm, triangular-lanceolate, white-ciliate, united to more than halfway, sometimes purple-tipped. Inflorescence globose, 10-20-flowered. Bracts 5-12 mm, linear-lanceolate to ovate, usually navicular, glabrous, sometimes purple-tipped. Bracteoles absent. Calyx tubular, 8-13 mm, white-pilose, tube 3-5 mm; teeth setaceous. Corolla bright yellow; standard 15-20 mm, platonychioid, usually retuse. Legume unknown. Fl. 7-8. Stony slopes, 2150-3300 m.
E. & N.E. Anatolia. A8 Çoruh: nr. Artvin (Grossheim 5: map 334). A9 Kars: E of Kağizman, N. side of pass between Akçay and Cumaçay, 2350 m, D. 46765! B8 Erzurum: mountains above Erzurum, 2150-2350 m, 1853, Huet! Bingöl: W. side of Bingöl Da., above Karlıova, 2500 m, D. 46183! Muş: S of Bingöl Da., nr. Gumgum, 2280 m, Kotschy 395! B9 Van: Artos Da., 2590 m, D. 22714! Bitlis: Süphan Da., 3300 m, D. 24762b! B10 Ağri: Doğubayzit, Hama Da., c. 2600 m, T. Bay top (ISTF 4861)! Iran, Caucasia, Ir.-Tur. element. Var. glabrescens irj. 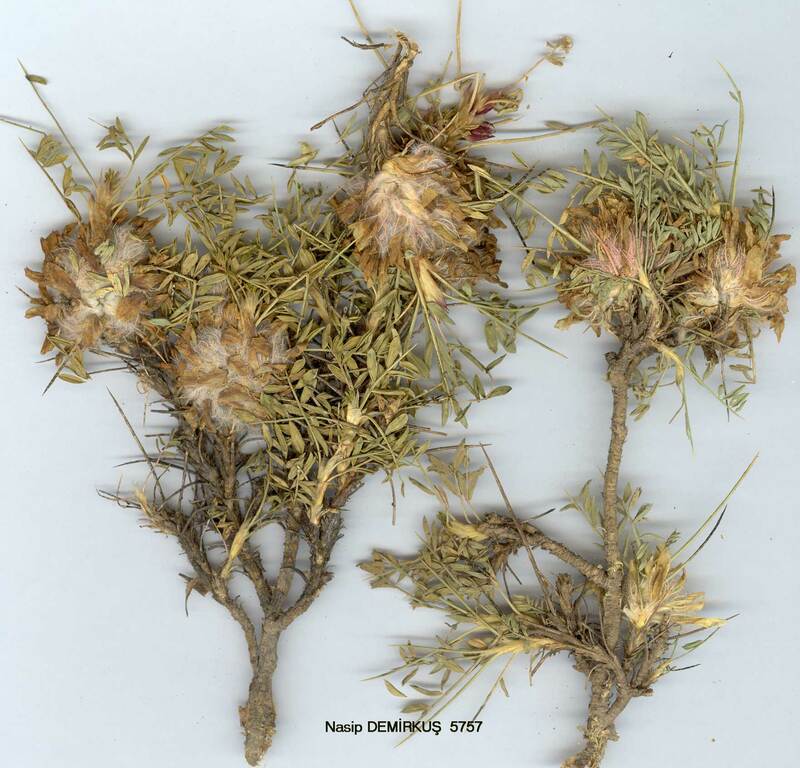 is not maintained because glabrescent and hairy leaflets are present on all specimens. Var. chromo-lepis Boiss. is said to have purple-tipped bracts, but only one specimen (D. 46183) shows this character. In some other specimens a tendency to a faint purplish colour on the bracts can be detected, implying that this character is unreliable.